We're going to start discussing this book in the next episode! Click here to preorder (affiliate link). Who needs fancy fountain pens and archival inks for writing when the Journalling Bug hits you? If you’ve got a pencil, you’ve got a medium which will allow your deepest thoughts to last until you are just a little pile of carbon atoms yourself. The guys rap about journalling in pencil, announce the giveaway winners from our anniversary. And Fresh Points. There’s always Fresh Points. And Johnny almost gets voted out of the show! But fear not: he's still with us. 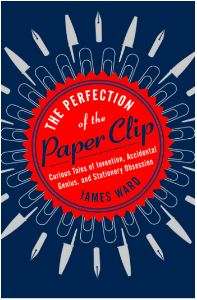 Note: A book we've been looking forward to, The Perfection of the Paper Clip: Curious Tales of Invention, Accidental Genius, and Stationery Obsession by James Ward, comes out April 21! We've ordered our copies, and on our next episode, we're going to start discussing! We hope you're join us in ordering this book and join in the discussion. If you do, would you use this link to order? It's an affiliate link, and helps us earn a little money.